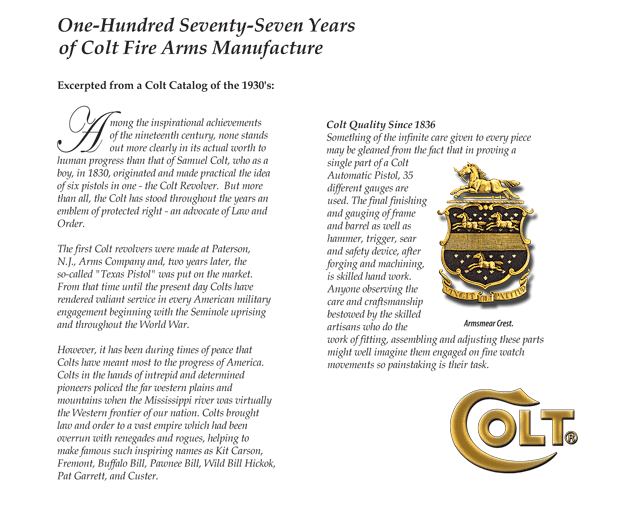 Colt's Mission Colt's Manufacturing Company is dedicated to delivering the world’s finest, innovative firearms to our military, law enforcement, and civilian customers, through a deep commitment to quality and safety. Colt's TEAM Values T – Teamwork – Collaboration is the backbone of Colt’s legendary quality and commitment to serve. E – Empowerment – Our highly motivated and engaged workforce is empowered to drive success. A – Accountability – We are accountable for performing at the very highest standards of quality, safety and integrity in every facet of Colt’s operations. M – Meeting Customer Expectations – Colt firearms save lives and defend shores…meeting customer expectations through the timely delivery of innovative, reliable products is more than a business objective…its mission critical.